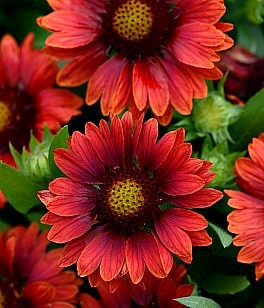 The Mesa Red Gaillardia is an early flowering perennial plant. Intense red flowers on sturdy nicely branched plants perform in landscapes and containers. Drought tolerant once established. The Gaillardia Mesa Red flowers show non-fading color throughout its flowering season. Group with the Mesa Bright Bicolor and Mesa Peach. Gaillardia Mesa Red is grown in a 3.5 inch pot. Orders shipping to AZ and CA will be bare rooted before being prepped for shipping.